Metallica frontman James Hetfield has revealed that one of the tracks on the band’s new album is about late Motorhead frontman Lemmy. Murder One appears on Metallica’s 10th album Hardwired… To Self-Destruct, which is released on November 18 via the band’s own Blackened Recordings label. You can now watch Metallica’s Murder One video after the band made every video from Hardwired… To Self-Destruct available ahead of the album’s release. 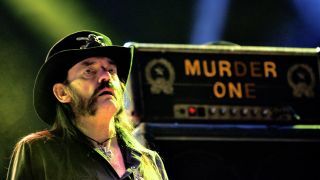 The title is a tribute to Lemmy’s favourite Marshall Super Bass Head from 1976, affectionately named Murder One. The Metallica song features lyrics made up of Motorhead song titles. In a question-and-answer session with fans on Sirius XM, Hetfield says: “Motorhead had a lot to do with Metallica sitting here right now. But just Lemmy, as kind of a father-figure, he helped us a lot. Ian ‘Lemmy’ Kilmister died last year at the age of 70 after a short battle with cancer. Meanwhile, footage of Metallica’s performances of Master Of Puppets and Sad But True on Howard Stern’s radio show this week has been released and can be viewed. Metallica launched a video for their track Moth Into Flame yesterday. They tour South America next month and they’ve confirmed two appearances in Denmark in February.